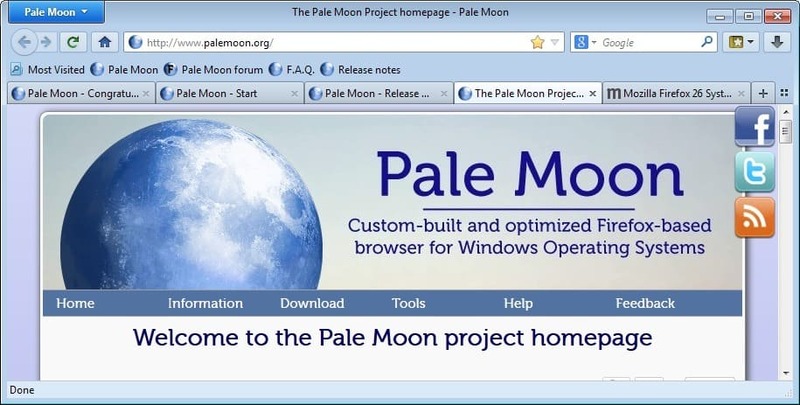 Pale Moon is based on the Firefox web browser but specifically optimized for the Microsoft Windows operating system. What sets it apart from Firefox is the fact that its author builds 32-bit and 64-bit builds of Pale Moon by default, optimizes them for Windows, and will keep several existing Firefox features and looks alive. The browser has gained some popularity as an option to keep true to the Firefox browser itself without having to update Firefox to the new Australis design and layout that Mozilla plans to ship in a couple of months. Today's release of Pale Moon 24.3.0 introduces another feature that sets it apart. It is now also offered for Intel Atom systems that you find usually in low-end devices such as netbooks. The Intel Atom builds have low system requirements with 256 Megabytes of free RAM and at least 100 Megabytes of free disk space. It needs to be noted that the browser will run better if the system has additional RAM or hard drive space to spare. Pale Moon's Intel Atom builds are only available in 32-bit and even though they match the same version number as standard Pale Moon builds, are considered in their early stages by their creator. What this means, among other things, is that they do not ship with automatic updates right now so that it needs to be updated manually instead. The builds can be downloaded from this page. That's however not the only change in the latest Pale Moon version. If you have used Pale Moon for a while, you will notice that the page title is displayed on the title bar again. If you are running the stable version of Firefox currently, or an older version of Pale Moon, you may know that the title is not displayed on the title bar in those browsers. Another change is the removal of the services tab in the add-ons manager. That does not mean that services functionality has been removed though, only that it is not displayed if no services are installed in Pale Moon at that time. Once you install a service, such as Facebook's for Firefox, you will see the services tab displayed there again. Last but not least, you will also notice that the navigation bar and toolbars won't be hidden anymore when in tabs on top mode and when internal pages and menus are accessed. Downloads in private windows are now shown again if you are using the classic downloads window. Gelocation was fixed and is working again. Pale Moon had to switch from Firefox's standard geolocation provide Google to another, as Google is now requiring an API key that only official Firefox builds have access to. Pale Moon switched to IP-API.com instead. More information link on blocked add-ons is working again. Malformed letters and scaling issues have been resolved. The most recent version of Pale Moon can be downloaded as a portable version or setup, for 32-bit or 64-bit versions, from the official project website. 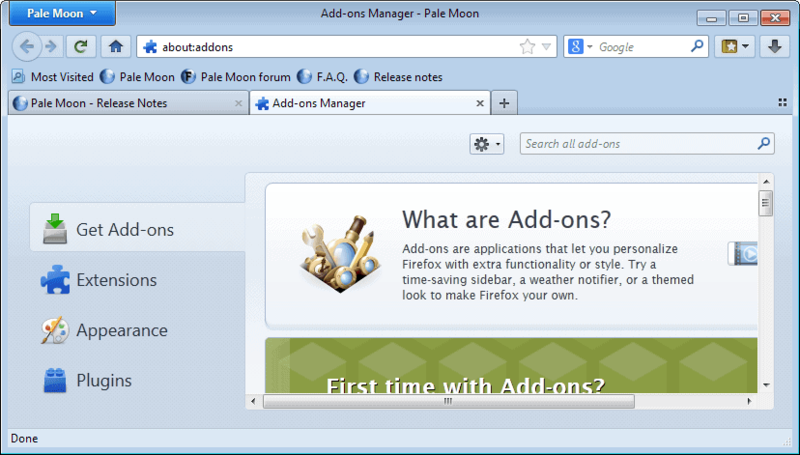 Pale Moon 24.3, a new version of the Firefox based web browser, introduces Intel Atom optimized builds among other new features. Although Pale Moon’s version numeration makes much more sense I hope they will either change it to match the Firefox release cycle or make their own as this right now most know-it-alls that I try to introduce to PM say that it’s ‘obviously outdated’. Yes I would expect some reference to which Firefox version it is based on. Very confusing. Is it secret ? IIRC they change the first number only when something major changes in Firefox (Firefox 24), the second with every next Firefox release (25-> 24.1, 26->24.2) or they introduce something major and the third when they fix something minor or when firefox releases their x.1 version with hotfixes. No it’s not secret. It is based on Mozilla/Firefox ESR version 24, with all security updates, so it’s not outdated as some short-sighted people think. Finally! been waiting for a new release. Maybe now classic compact will work again. And that is the reason why Pale Moon does not make sense. Especially if the Creator really plans to keep the old UI – in that case expect the majority of add-ons and full themes partially broken or not working at all. Same Problems for Cyberfox too btw ! Who is looking for an escape of Australis or a futureproof browser should better use Seamonkey or go away from Firefox custom builds, because when Australis hits stable, all the existing third Party rebrands get obsolete! It won’t be obsolete to me. When Australis hits stable, Pale Moon will be the primary browser that we push instead of Firefox. There is no excuse for the terrible Chrome-style interface at all. I run a computer repair shop and I have more people come in confused by Chrome somehow getting drive-by downloaded and installed and not knowing how to use it than I can count. I hope that everyone possible moves to Pale Moon to protest this change in Firefox. Wish there was a way to turn off the title bar. I find it distracting and unnecessary. That’s the info my tab tells me, I don’t need a duplicate of it pulling my eye up to the top of the page–same reason I don’t have my tabs on top. Customize from the Navigation Bar and “Tabs On Top” removes Title Bar.